This Bold Rock Cidery Wedding was an all time favorite for so many reasons! 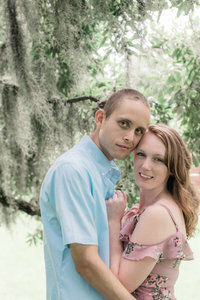 We have loved getting to know Kyle & Julie the months before their wedding day! Julie was a bridesmaid for one of our previous couples in April, Stephanie & Daniel, it was so fun seeing her and Kyle celebrating along with them (and they got to see us in action)! The location was just breathtaking! We have been traveling out to the Blue Ridge Mountains least once a year since our 1st wedding anniversary in 2013. Bold Rock Cider has always been a favorite of ours. It’s so inviting, with a beautiful creek and views of the mountains on the back deck. They started their wedding weekend nearby at The Orchard House Bed & Breakfast. It’s such a beautiful bed and breakfast and was the perfect spot for them to get ready in! There was the main house, and then there was another house down the driveway where Kyle and his groomsmen got ready. So much beautiful light pouring in, and the grounds were so gorgeous! After their final touches, Kyle & Julie did their First Look. It was such a sweet and sincere moment for us to capture! Then it was time to go to Bold Rock for the ceremony! The sun was getting lower and it was the perfect end of summer evening. Their arch was so unique and decorated so beautifully. They read their own vows to one another and had a lavender toss as they were recessing (it smelled amazing)!! The reception was a blast! Kyle & Julie put together a mash up of songs & dances and showed off on the dance floor!